And The Winner Is…Rep. Kirsten Gillibrand! 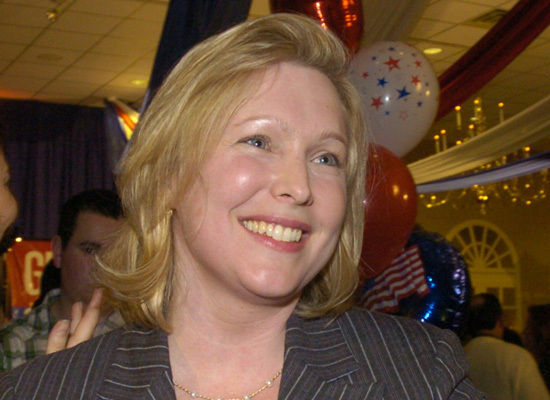 Here she is my friends, the new junior senator from New York you’ve never heard of: Congresswoman Kirsten Gillibrand, at your service. NY Gov. David Paterson‘s not-at-all controversial pick to replace the unfillable void left by dear Hillary’s departure for her consolation prize running the State Department. Clearly, Miss Gillibrand was chosen for her loyal service as Rep. of New York’s 20th congressional district in the U.S. House, and not because a certain replacement governor thinks her ties to moderate Democrats upstate and connections to Clinton’s cash-machine could help with his 2010 election bid. So, that means we don’t have to hear about Caroline Kennedy and the senate seat she’s not filling anymore, right? Over the media’s dead body. They haven’t spent the last few weeks covering every jaw-dropping twist ‘n turn in this thrilling senate seat saga to quit now. Things are just starting to heat up! Besides, who can resist a bizarre love triangle featuring political power-grabs, the state of New York, and at least two of the Democratic party’s major dynasties?